Milltek Sport Non Resonated Cat Back Exhaust System. By fitting Milltek exhaust components you can rest assured that these are very high quality, high-performance parts that will in most cases outlive the car. Milltek Sport have appointed key distributors and are currently exporting to more than 80 countries around the world. Milltek Sport exhausts are produced in high quality type-304 aircraft grade stainless steel. NEW FROM MILLTEK A STAINLESS STEEL CAT BACK SYSTEM NON- RESONATED TO FIT AUDI S3 2.0 TURBO 2006 - 2012. NEW FROM MILLTEK A STAINLESS STEEL CAT BACK SYSTEM NON-RESONATED TO FIT AUDI S3 2.0 TURBO 2006 - 2012. SKU: SAUS030. You only have to touch a Scorpion exhaust to appreciate the premium design and construction qualities, which translate into tangible gains in both performance and reliability. But the real difference is the way a Scorpion feels. Donor Car: 2007 Audi A3 8P 1900cc. The New and Used Audi Parts Specialist for all Audi models worldwide. It may fit others. Audi Part Number: Unknown. MODEL: AUDI A3 8P 2.0L TDI 103KW M68. Trim: SE TDi. Model years: A3 2003 To 2008. May fit other models of audi and vw. Manufacturer: Audi. The part will usually be used and will show signs of wear and tear unless listed as new. Donor Car: 2009 Audi A3 8P FL 1900cc. Generic Notes on this Part: Exhaust Cat Back from a Facelift car so has straight tail pipes not down facing. The New and Used Audi Parts Specialist for all Audi models worldwide. This Complete Exhaust System corresponds to the image provided and also the vehicle as displayed in the compatibility guide above. In addition to this guide, you can also check the vehicle details in the box above labelled "Item Specifics". If you are unsure of anything, just click contact us - we will need your car registration number so that we can double-check for you before you buy. If this is not sent before purchase we will assume you have purchased the correct item and dispatch the system for you. 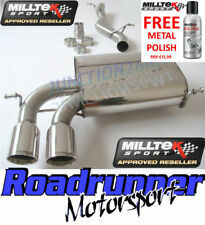 Milltek Sport Non Resonated Cat Back Non Valved Race Exhaust System. By fitting Milltek exhaust components you can rest assured that these are very high quality, high-performance parts that will in most cases out live the car. Fits S3 2.0T 8V (Saloon) – f its to Scorpion and OE system. Scorpion hand built exhaust systems not only give you real exclusivity, but added value too. The feeling of having a Scorpion exhaust fitted is like no other, due to the passion and expertise that goes into the design and build. Milltek Sport Non Resonated Cat Back Exhaust System. By fitting Milltek exhaust components you can rest assured that these are very high quality, high performance parts that will in most cases out live the car. Jetex Performance Exhausts, Since 1986. A fitting kit is provided with every Jetex system. (see pictures). About Jetex Performance Exhausts. Sound reduction is a critical design concern with any exhaust system. Milltek Sport Cat Back Exhaust System. By fitting Milltek exhaust components you can rest assured that these are very high quality, high performance parts that will in most cases out live the car. Milltek Sport exhausts are made from high quality type 304 aircraft grade stainless steel that is anti-magnetic and is less susceptible to discolouration. Milltek Sport Resonated Cat Back Exhaust System. By fitting Milltek exhaust components you can rest assured that these are very high quality, high-performance parts that will in most cases outlive the car. NEW FROM MILLTEK A STAINLESS STEEL TURBO BACK SYSTEM RESONATED INC CAT TO FIT AUDI S3 8P 2.0 SPORTBACK 2007 - 2012. A Milltek Stainless Steel Turbo Back System. Milltek Sport is the proven product! Milltek Sport will make your car look, sound, feel and perform like never before! Milltek Sport Turbo Back System inc Hi-Flow Sports Cat. By fitting Milltek exhaust components you can rest assured that these are very high quality, high-performance parts that will in most cases outlive the car. AUDI A3 8P 1.4 Exhaust Pipe Rear 07 to 13 BM. AUDI A3 (8P1) 1.4 TFSI Hatchback Petrol 09/2007 08/2012 FWD 16 125 92. AUDI A3 Convertible (8P7) 1.4 TFSI Convertible Petrol 02/2011 05/2013 FWD 16 125 92. Full Exhaust System. 1 x Direct Fit Rear Exhaust Silencer Back Box. 1 x Approved Front Exhaust Pipe & Catalytic Converter. 2 x Exhaust Rubber Mount. 1 x Centre Exhaust Middle Silencer Box. Ready To Help! Full Exhaust System. 1 x Direct Fit Rear Exhaust Silencer Back Box. Ready To Help! Available And Ready To Dispatch! 1 x Exhaust Assembly Paste 140g Tube. 1 x Centre Exhaust Middle Silencer Box. 2 x Exhaust Rubber Mount. Full Exhaust System. 1 x Direct Fit Rear Exhaust Silencer Back Box. Ready To Help! Available And Ready To Dispatch! 1 x Exhaust Assembly Paste 140g Tube. 1 x Centre Exhaust Middle Silencer Box. 1 x Exhaust Rubber Mount. Full Exhaust System. 1 x Direct Fit Rear Exhaust Silencer Back Box. Ready To Help! 1 x Centre Exhaust Middle Silencer Box. 1 x Exhaust Rubber Mount. Available And Ready To Dispatch! 3 x Exhaust Rubber Mount. SKU: SAUS050D. You only have to touch a Scorpion exhaust to appreciate the premium design and construction qualities, which translate into tangible gains in both performance and reliability. But the real difference is the way a Scorpion feels. Milltek Sport Turbo Back including Hi-Flow Sports Cat. By fitting Milltek exhaust components you can rest assured that these are very high quality, high-performance parts that will in most cases outlive the car. Full Exhaust System. 1 x Direct Fit Rear Exhaust Silencer Back Box. Ready To Help! 1 x Centre Exhaust Middle Silencer Box. 1 x Exhaust Rubber Mount. Available And Ready To Dispatch! 1 x Exhaust Assembly Paste 140g Tube. By fitting Milltek exhaust components you can rest assured that these are very high quality, high-performance parts that will in most cases outlive the car. Milltek Sport exhausts are made from high-quality type 304 aircraft grade stainless steel that is anti-magnetic and is less susceptible to discolouration.